Catamaran Lagoon 440 - New Years Special. 20% off normal rates for Charters in BVI. 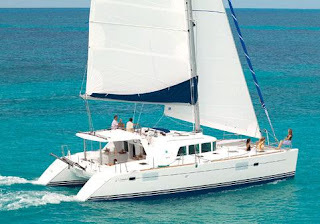 Voted "Best Charter Catamaran 2005" by Cruising World. The Lagoon 440 is the perfect choice to enjoy carefree sailing vacations in the British Virgin Islands. Maximized to the fullest, there are 4 spacious Cabins, each with its own shower and head. Below deck enjoy the beautiful panoramic views from the interior salon. Cook up your meals in a fully equipped kitchen. Or just relax in the lounge while your guests sunbathe in the trampoline across the bows. All this and more. Capt. Mike is pleased to announce that we are offering 20% off on normal rates for the Lagoon 440 for New Year's Charters in BVI. Also we have a huge choice of Bareboat Charters worldwide. For more information you can call (800) 874-2584 or (317) 596-7600 or click here to email Capt. Mike.